[2017-05-08T12:57:02] INFO: ignoring --enable-drag-drop, not supported below vista. [2017-05-08T12:57:22] INFO: ignoring --enable-drag-drop, not supported below vista. [2017-05-08T12:57:32] INFO: ignoring --enable-drag-drop, not supported below vista. How do I get the connection between the two back? Hi @Patricia Bracken. Can you check if you have multiple IP addresses shown on your server's Synergy interface? You can send us a screenshot if that's possible. I don't know what that means. Where do I find that? Hi @Patricia Bracken. 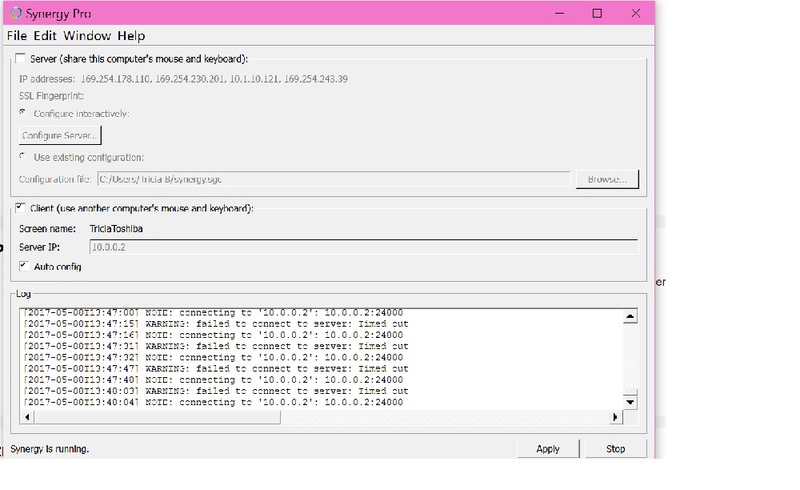 On your client machine, uncheck Auto config and manually enter 10.1.10.120 for the Server IP box and try to start/apply it again. Thank you!! that did it! !